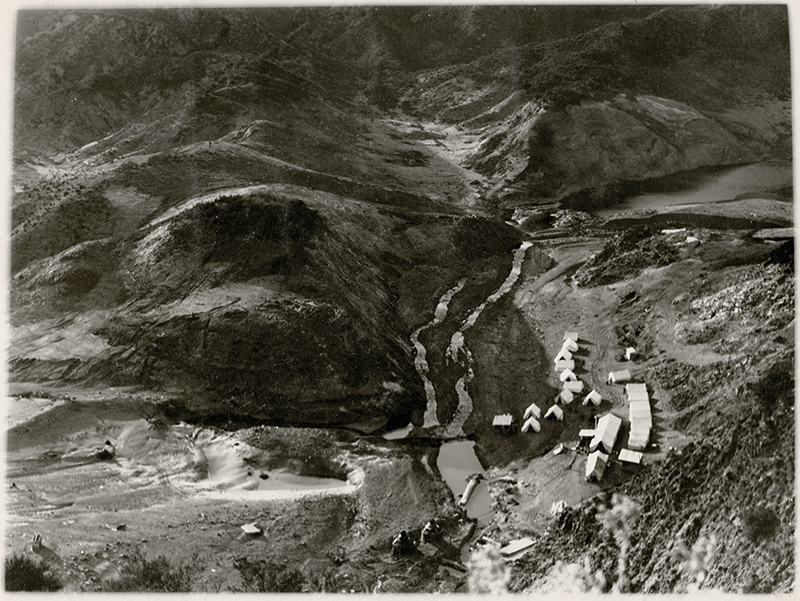 SaintFrancisDam.com HS7066 | St. Francis Dam Disaster | Power House 2 Reconstruction Camp, Top View, 1928. Crew members from the L.A. City Bureau of Power and Light (DWP predecessor) live in tents as they reconstruct Power House 2, which was destroyed when the St. Francis Dam broke just above it on March 12, 1928. This 8x10-inch print is a bit later than this photograph, in that there are more tents, and the turbines at center-bottom have stopped spewing water. The Power House 2 community is completely gone; it was at center-top. HS7066: 9600 dpi jpeg from original 8x10 glossy print, SCV Historical Society collection. Stamped imprint on back indicates it was donated by Thomas E. McNeill of Valencia.